Shipping alcohol is a matter that can create hassles for the store owner, shipping carrier and even the recipient. This is because there are different restrictions according to the local regulations of sender’s and the receiyou never’s destination. It is always recommended to contact your local DHL office to know more about any restrictions related to the shipping of alcohol. In this article we will discuss how you can legally ship alcohol products via ELEX DHL Plugin. As an example, we will discuss the DHL Express guidelines you need to follow to export and import alcohol in the US. You should check with the DHL support team if you have any doubts regarding the process. DHL Express adheres to the local regulations to ensure that shipments containing alcohol can be shipped without hassles. There are specific requirements that need to be met by both exporters and importers when it comes to shipments containing alcohol. If you are sending alcohol through DHL Express, your package will be picked up only if you are a licensed producer or wholesaler of alcohol. You also need to be approved to ship by DHL. How to get the ‘Approval to Ship’? You have to follow certain procedures to get the approval to ship in the US. You will get this only if you are residing in one of the DHL permitted states. Fill and submit the ‘Agreement to Transport Alcoholic Beverages’ form to your DHL account representative or to the customer service team. Along with that, you need to submit copies of the Federal Basic and state issued permits related to this. Once you have submitted these documents, DHL will do the necessary verification processes. After the verification, you will be added to the Approved Alcoholic Beverage Shippers List. For consumable products, including alcoholic beverages, provide prior notice to FDA. The waybill has to include the FDA Prior Notice number, along with a requirement for Adult Signature. The description field should contain a statement – “Contains Alcohol – Signature of a Person Age 21 or Older Required for Delivery”. Attach the printed copy of FDA Prior Notice with the complete list of commodities to the Commercial Invoice. In addition to this, most states in the US require an Import Permit as well. For shipments to these states, you need to include the Importer Permit number also to the Commercial Invoice. Permit is not required for Connecticut, Georgia and Washington. Certificate of Age or Certificate of Origin, from either the Shipper or the exporting country, for items with countries of origin that require these documents. When a shipment reaches the US, it has to be reviewed by the customs authorities. In case of any further requirements, the customs compliance team of DHL will contact the importer and get it sorted. Once everything is made sure to be in order, it will be submitted for customs and the FDA for release. How ELEX WooCommerce DHL Plugin helps to ship alcohol products? The plugin comes with several settings that will help you in complying with the special requirements for shipping alcohol products. In the Label & Tracking tab, you will find an option to Enable Delivery Signature at Checkout. This would enable your customers to choose the delivery signature option while checking out. There is also a field where you can input Shipping content description for the orders. The text you add here will be visible on the shipping labels you print. In addition to label settings, there are certain settings at the product level that might be relevant to shipping alcohol products. 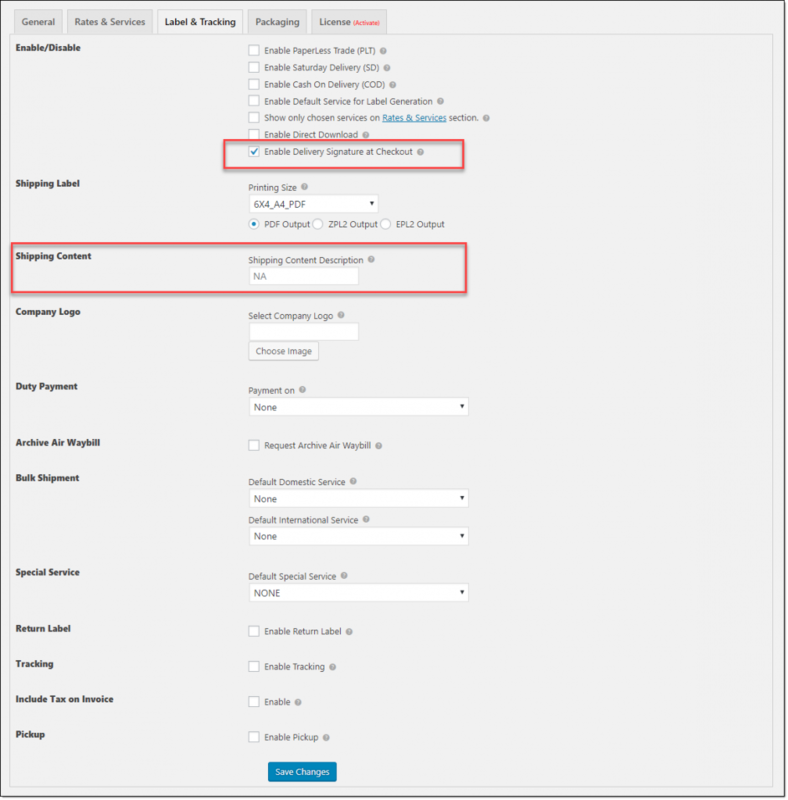 The plugin adds custom fields on the product data field, which will help you with some of the specific requirements. There is an option to enter the HS Tariff number. This will help to identify the product, which is a requirement in international shipping. Similarly, you can enter the country of manufacture too here, which is another important aspect in how shipping regulations apply. 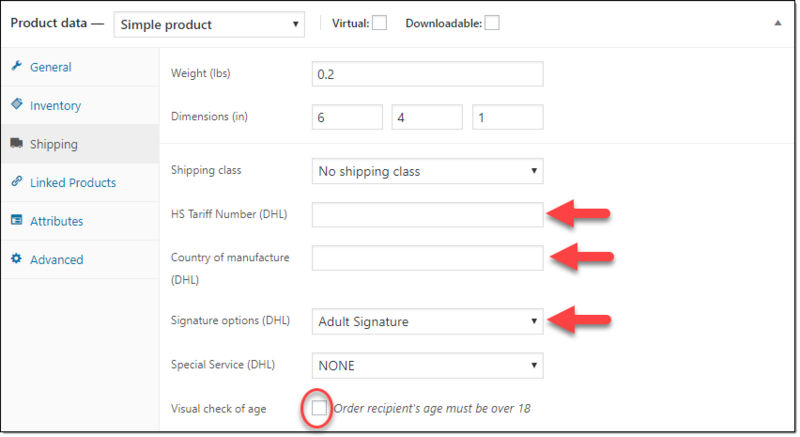 There is an option to make Adult Signature required to deliver the product. You can choose Adult Signature from the Signature options dropdown. Also, you can check the field for ‘visual check of age’. This makes sure that the recipient of the shipment will be over 18 years of age. DHL follows international shipping guidelines in helping you ship alcohol products. Hope this article has given you a basic idea on shipping alcohol. Please contact your local DHL customer service adviser for clear guidelines applicable to your country for shipping alcohol products. For more information on WooCommerce DHL plugin, check the documentation page. You can see the working of the plugin on the live demo. For any queries regarding the working of the plugin, contact our support team.